The other morning, I wanted a cup of tea. When I took the time to get it, the experience was so much more. I walk into the kitchen at work to grab a random coffee cup. 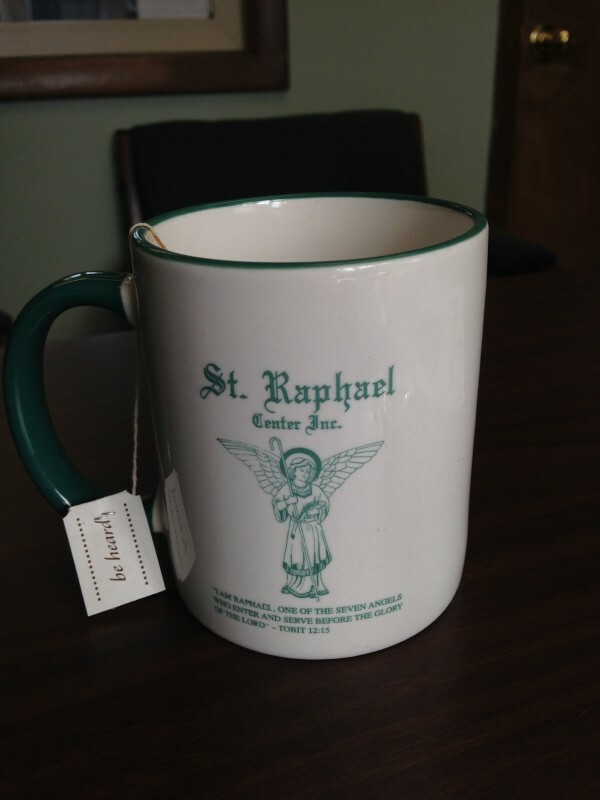 When I open the cupboard, I see one that has the angel Raphael on it. It was right in front, almost pushed to the edge, like it was waiting for me. I never saw this coffee cup in the kitchen before and felt it was a message to help remind me that angels are always around us. The sun is shining through my office window. Just then, a small white feather floats in front of me, right in front of my computer screen. I reached out to it, as I truly believe feathers are a sign of an angel visit, plus I wanted to keep it as a reminder of this experience. I could not catch it. It disappeared and went away. It is these small things in our life that bring us happiness. I was very happy for the reminder that angels are always there for us. I have no doubt that it was an angel visiting me. This was five minutes of my day. Five minutes that I knew without a doubt that angels were with me. We are loved more than we know. This entry was posted in Inspiration, Metaphysical, Spirituality and tagged angel, guardian angel, spirit guide, the light. Bookmark the permalink. We came back two hours later, and I have forgot about this issue momentarily until I got to the kitchen, there was a small feather, in the middle of the island, it was white and beige like from a medium size bird, where the feather came from? everything was closed! and that was my message, instantly I could associate both things. After that I was happy, that somehow I feel like I have establish some sore of communication with highers being. Thank you for sharing your awesome story. We really are loved more than we know and your story is just one more example of it. I am open to all signs, I don’t doubt any sign anymore. In the beginning i think I did. Now I accept and appreciate with gratitude. Many of my signs from my dad are numerical: 333, 444 etc. A lot of them are related to things he loved, airplanes, things we did together and of course FOOD! My mom gets signs like hearing the Viennese Symphony on the radio (my dad was Viennese) but instead of embracing it she gets scared. I try to tell her to enjoy it but it freaks her out a little and yet soothes her too a bit. Karen I don’t know if I told you mine when last we talked but I think I did. If not I am posting on it eventually. I know you see and talk to angels… You are awesomely connected my friend! This posting of yours give me the encouragement to change and look at the little thing in life from a different angle. I am so glad I stumbled upon your websites or should I say this has been calling me for many years, but I was too blind to see or hear it. Thank you four your encouragement and please keep posting you inspirational messages.